Data Deluge: Three quarks for Muster Mark! "In 1963, when I assigned the name "quark" to the fundamental constituents of the nucleon, I had the sound first, without the spelling, which could have been "kwork." 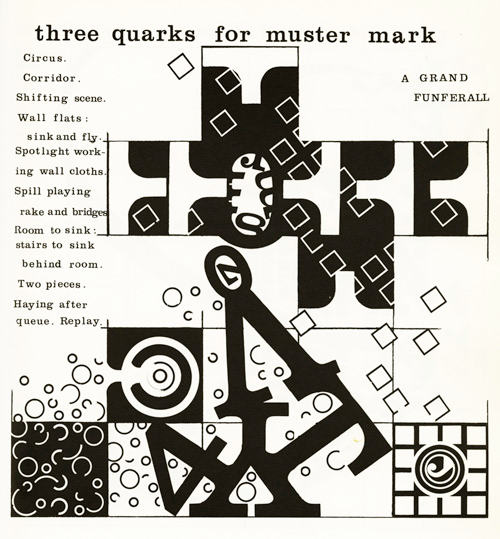 Then, in one of my occasional perusals of Finnegans Wake, by James Joyce, I came across the word "quark" in the phrase "Three quarks for Muster Mark." Since "quark" (meaning, for one thing, the cry of a gull) was clearly intended to rhyme with "Mark," as well as "bark" and other such words, I had to find an excuse to pronounce it as "kwork." But the book represents the dreams of a publican named Humphrey Chimpden Earwicker. Words in the text are typically drawn from several sources at once, like the "portmanteau words" in Through the Looking Glass. From time to time, phrases occur in the book that are partially determined by calls for drinks at the bar. I argued, therefore, that perhaps one of the multiple sources of the cry "Three quarks for Muster Mark" might be "Three quarts for Mister Mark," in which case the pronunciation "kwork" would not be totally unjustified. In any case, the number three fitted perfectly the way quarks occur in nature."